OPAL-RT hands-on laboratories and test benches are designed to allow students to build their own models and validate them in a real system, thus providing hands-on experience on the integration between hardware and software. 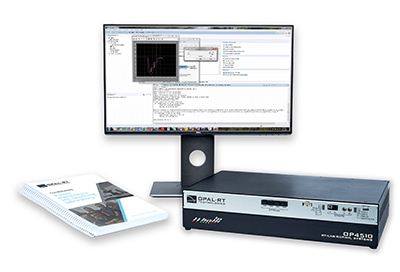 OPAL-RT educational courseware includes software, hardware and customizable exercises that allow students to learn and experiment with HIL and RCP tools commonly used in innovative power electronics and power systems industries. By putting theory into practice, students are “in the loop”. Our courseware material can also be purchased separately. 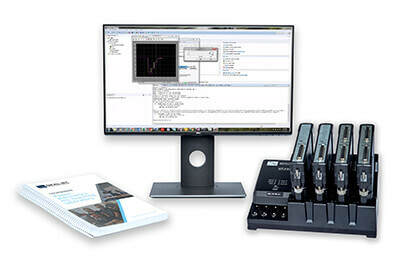 The teaching material is intended for teachers and students who already have access to our hardware solutions. This educational courseware, based on an OP4200, is intended to teach power electronics to university undergraduate students. Students can run experiments and learn power electronics (such as converters, rectifiers, and inverters, including the control logic) using the same HIL and RCP tools commonly used in the innovative power electronics industry. This laboratory combines the best of both OPAL-RT and Festo solutions to deliver academic researchers and teachers the ideal Hardware-in-the-Loop (HIL) and Rapid Control Prototyping (RCP) simulation system to conduct experiments and teach in the fields of electrical machinery, power converters and wind energy generation. 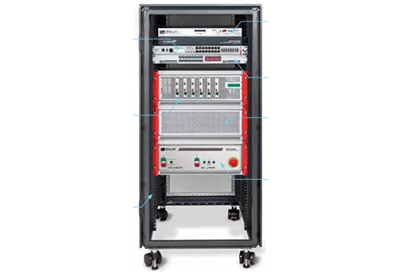 The Drivelab Kit is a fully integrated motor drive laboratory, designed to enable students to perform a variety of experiments on AC and DC machines. As learning outcomes, students will have:hands-on experience with hardware including power electronics, motors, sensors and measurement instruments, and will learn parameter identification and motor modeling, current and speed control loop design, and scalar and vector control techniques. The Power System teaching laboratory is intended to perform transient stability analysis of electric grids. The basic power grid example, covered in all fundamental electric grids courses, is analyzed in time-domain and phasor-domain. This educational courseware based on a OP4510 intended to teach power electronics to university undergraduate students. Students can experiment and learn power electronics, such as converters, rectifiers, and inverters, including the control logic with HIL and RCP Tools commonly used in innovative power electronics industry. Modular, flexible and configurable, the power electronics test bench combines a state-of-the-art Hardware-in-the-Loop (HIL) simulator from OPAL-RT with Imperix’s Rapid Control Prototyping (RCP) system and real power hardware. It enables rapid development of power electronics, drives and smart grid applications across industry and academia. 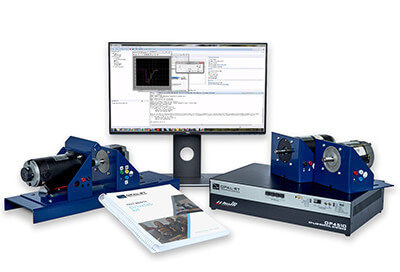 This courseware kit helps to master synchronous and asynchronous machines, from parameter identification to full operation in generator and motor modes. 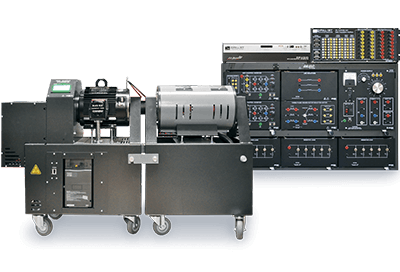 Our electric machine teaching laboratory comes in two(2) sections with five(5) modules each. The Power System (PS) teaching laboratory is intended to perform transient stability analysis of electric grids. 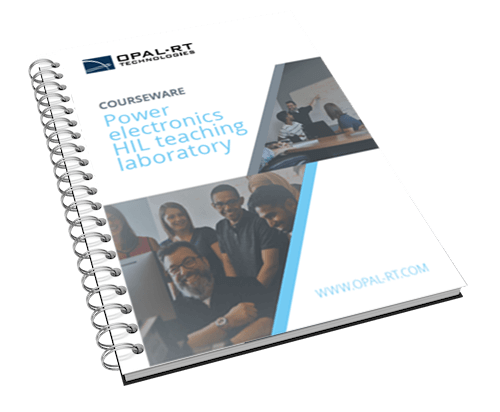 Power electronics HIL teaching laboratory is an educational courseware intended to teach power electronics to university undergraduate students. The electric machines teaching laboratory constitutes a fundamental learning tool to thoroughly understand synchronous and asynchronous machines. Our courseware comes in two section with five modules each. Prices listed on our website are based on your location. All prices exclude freight, duty or taxes to which these products may be subject. This pricing is not valid for grants proposals. Please contact your nearest sales representative for complete and accurate pricing.